If you need a reader for this .pdf file it is available free from here. In the Diocese of Guildford. 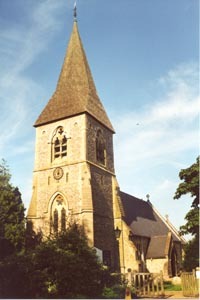 St Mary’s church was built in the 1850’s close to the site of a much earlier church which had become to small for the needs of the congregation. Stones from the old church helped to construct the new and stonework remnants are preserved in the churchyard in the form of a grotto built in memory of the Reverend Ferdinand Faithful the rector at the time of the rebuilding. The church is a typical Victorian church with nice stained glass in the windows that is of various ages. The wood panelling is said to have come from Newgate Prison in London as a gift from the Cunliffe family of Headley Court. The choir screen is in memory of Theodore Evelyn Reece Phillips the rector of Headley until 1941 who was a very famous amateur astronomer and President of The Royal Astronomical Society. Headley's bells are not rung by a team of bell ringers but can be rung by one person from the choir vestry using a rope pull and hammer system. Modern lighting and sound systems are in place to cater for the entire congregation during services. The Church is positioned high on the North Downs and the spire is visible from much of London, along with Ranmore Church on the other side of the Mole Gap the churches are known as the North Downs Twin Spires. 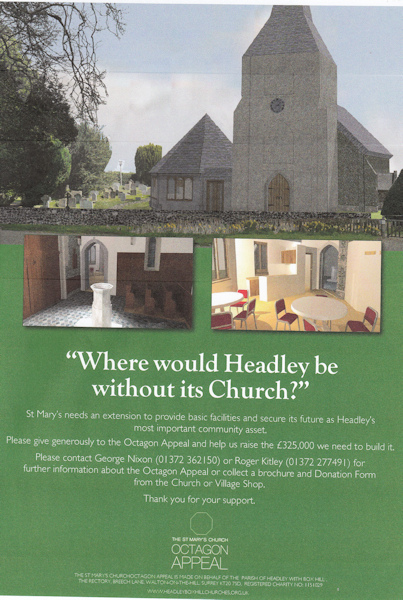 Services are held every Sunday, precise details are available in the Parish Magazine or the link at the top of this page. For information on special services and weddings etc contact the Rector. The majority of the old church records are lodged with the Surrey History Service at Woking.